The alkaline phosphatase is a periplasmic homodimeric hydrolase. Each monomer contains 429 amino acids. Figure 2. 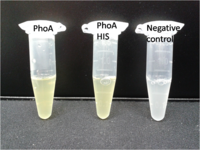 Liquid culture from the triple knockout E.Coli strain overexpressing PhoA or PhoA-His respectively after reacting with pNPP. The negative control contains liquid culture without pNPP added. Figure 3. Liquid culture from the triple knockout E.Coli strain overexpressing PhoA after reacting with BCIP. The negative control contains liquid culture without BCIP added. 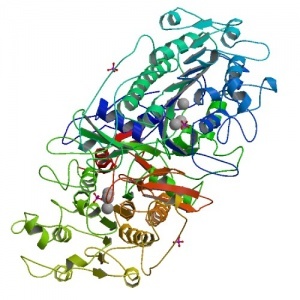 ETH Zurich 2013 used PhoA in their project as reporter enzyme. To test the functionality of the enzyme, liquid culture of the ΔaesΔgusAΔnagZ Escherichia coli strain overexpressing PhoA was incubated with pNPP (Figure 2). Another suitable chromogenic substrate for detection of PhoA is BCIP (Figure 3). Figure 1. Enzymatic reaction of PhoA with pNPP (1) or BCIP (2). Cell lysate for the assay described below was tested for active enzyme in the same way, but with the fluorescent substrate 4-MU-phosphate. The picture in Figure 5 was taken with a common single lens reflex camera mounted on a dark hood at λEx 365 nm. Figure 4. Enzymatic reaction of PhoA with 4-MU-phosphate. Figure 5. Cell lysate from the ΔaesΔgusAΔnagZ E scherichia coli strain overexpressing PhoA after reacting with 4-MU-phosphate. Figure 6. 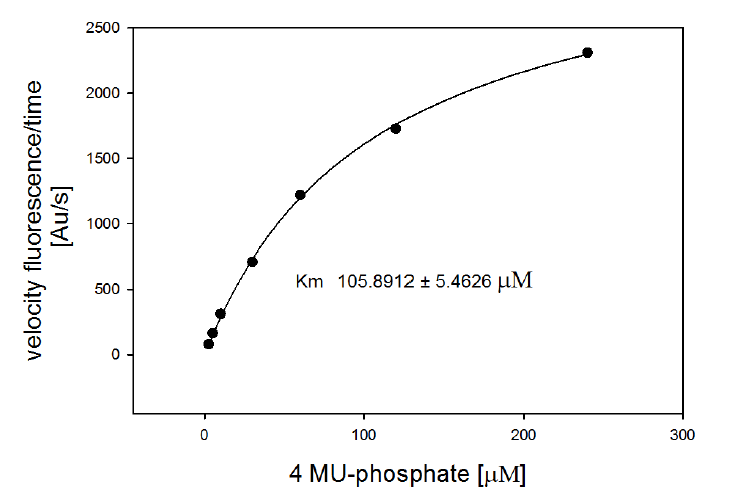 Michaelis-Menten-Kinetics of PhoA cell lysate from E.Coli overexpressing PhoA: plots velocity versus substrate concentration (2.5 μL, 5 μL, 10 μL, 30 μL, 60 μL, 120 μL, 240 μL) in 20 mM Tris buffer of pH 8. A kinetic value for Km obtained by fitting the raw data to standard the Michaelis Menten equation; Km = 105.9 ± 5.3 μM. All assays were carried out in triplicates, results are presented as means.